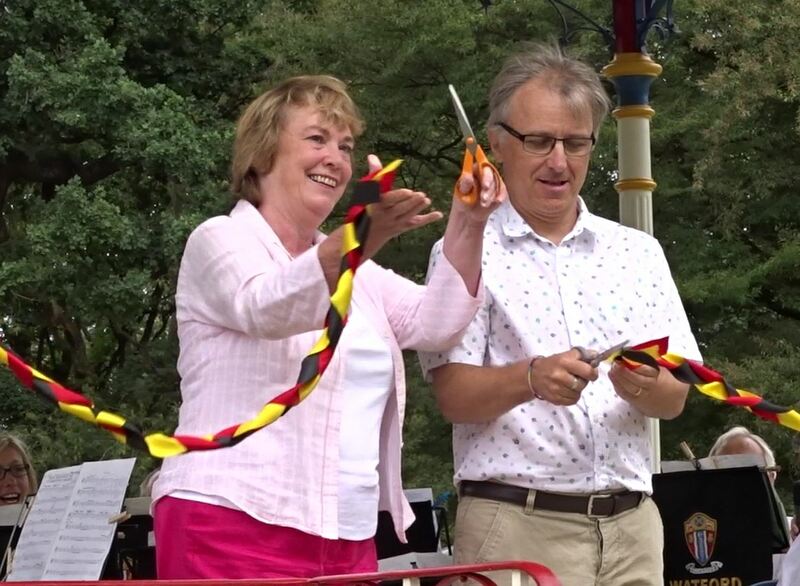 Today at 1:30pm the Mayor of Watford, along with Paul Rabbitts head of Parks at Watford cut the ribbon to officially open the New Bandstand at Cassiobury Park. The Watford Band played a few tunes, then the Mayor Dorothy gave a speech before introducing Paul Rabbitts who is the Bandstand Geek who then gave his talk. Milly Soo followed with her Jazz band whilst JiveSwing dancers partied with the audience enjoying the day. It took six months of work by a team of experts who recreated a bandstand for the Queen, funding from the Heritage Lottery and Big Lottery funds, and the support of Watford Borough Council to make this happen. Now Watford’s historic bandstand will be re-opened, on the spot on which it was originally built, in Cassiobury Park. The bandstand was originally opened in September 1912, and attracted crowds of more than 1,500 people. Then in the seventies it was moved to the square outside the Library. When Watford Council won funding to revamp Cassiobury Park, returning the bandstand to its original position was part of the plan. That money also paid for the renovation of the Cha Café – which openened to the public on Saturday 20 August. The development of the pools area and the creation of a hub building are still underway – that work is expected to be complete by next spring. Elected Mayor of Watford Dorothy Thornhill said “We’re committed to protecting Watford’s heritage, and the bandstand is an important part of Cassiobury Park’s history. I’m so pleased to see it return to its original site. The success of recent events like Jazz, Jive Swing on 24 July - also funded by the Heritage Lottery and Big Lottery funds - shows how valuable a live music venue in the park will be.